Stocks only rise with Fed's QE -- time to lock up your savings? 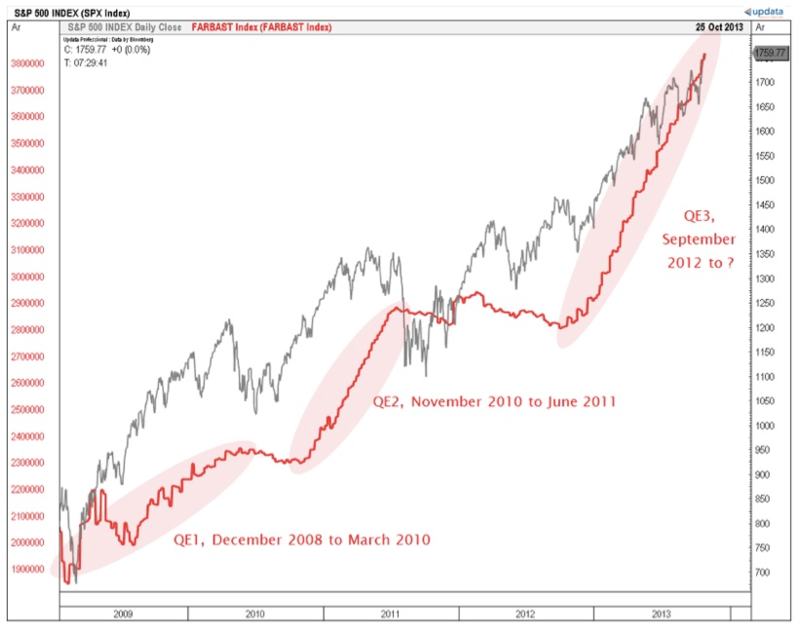 This chart shows that since 2009, every single penny of the stock market’s gains have come during rounds of Quantitative Easing. As the Fed has bought more assets, stocks have soared; and when the Fed has taken breaks from adding more liquidity to the markets, stocks have slammed on the brakes. For those of you who responded to this chart nearly with abject horror, we can’t blame you. Here’s what we’ve been saying for years: The frenzy surrounding the latest stock market surge is quite intoxicating on the way up, but we all know how the drinking binge ends: It ends badly, with a terrible hangover the morning after. We all remember 2008. We all remember 2001, and we keep promising and swearing that we’d never do that again, we’d never feel that pain, we’d never lose that much, we’d never be that devastated again. Yet here we are, partying hard, like it’s 1999. It’s fine to drink a little and have some fun… as long as you know your limits. Of course you know not to gamble with your retirement savings. It rarely turns out as it did for Morgan Freeman in the recent film “Last Vegas”, with a penthouse suite and fistfuls of cash in his pocket as he boards the plane out of town. That makes for good Hollywood, but here in the real world, it makes for bad retirement planning. Right now, the stock market is just like Vegas, but the house (the Fed) has decided to lose for a while by setting the slot machines to “jackpot” and flooding the casino with free money. But there’s a big problem: You don’t know when things will change again. All those winnings are imaginary until you walk out the door with them. To put it another way, watching the stock market go up during Quantitative Easing is like being at an auto auction where money is constantly dropping from the ceiling. It is no shock when the cars sell for record-breaking prices. But when the cash stops falling, what are the cars really worth? As much fun as the auction is, in the end, many people will be stuck with overvalued clunkers. The key is to not get in over your head and put yourself in a position where you could lose everything. If you do play the stock market, it would certainly help to consult with a really good psychic about when to get out, because there really is no accurate way to guess when the peak has been reached. A psychic would have as good tips about that day as anyone else. But if you don’t know any bona fide actual psychics (wouldn’t they ALL be traders on Wall Street?) it’s better to get out just a bit early and give up that last little bit of gain before the market tanks. Whatever you do, do NOT ride a smidge too long when the panic starts in earnest. That is when it gets ugly. Really ugly. When things get ugly, that is when you will be really glad you put a healthy portion of your portfolio in good old, rock solid gold. Taking even just some profit now and buying gold is the equivalent of taking your casino chips to the cashier window and heading straight to the airport. Once those chips are converted to gold, there’s nothing that can take them away: no panic, no crash, not inflation, and certainly not the Federal Reserve. Your winnings are safe and you can breath easy.